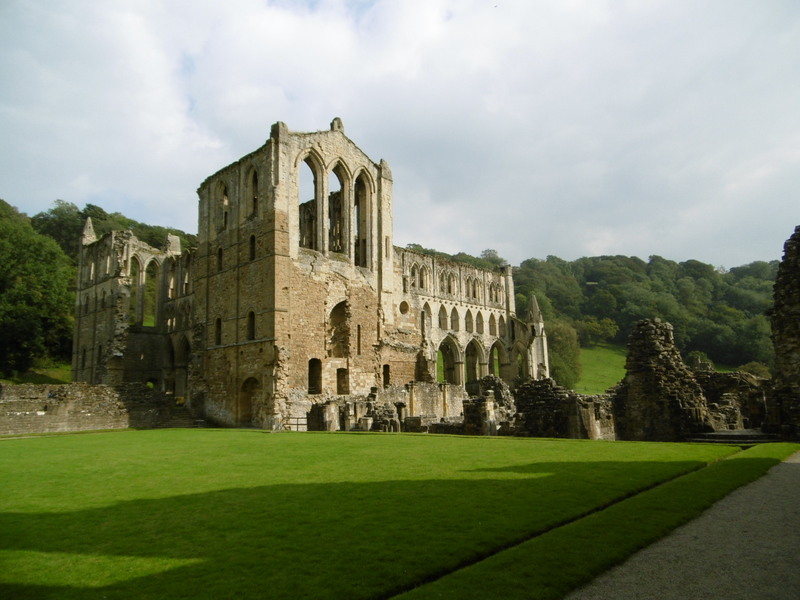 Monasteries, abbeys, priories – they never look so good as when they’re ruined, don’t you think? I spent many a childhood holiday trotting behind a father who was batty about architecture. Grand houses decked out in precious furniture and china and paintings. Castles and abbeys in varying states of decorative decay. Cathedrals and churches held aloft by flying buttresses and topped by soaring spires. Which is probably why I like nothing so much as a jolly good view. Romantic ruins silhouetted against moody skies. Empty buildings blessed by an absence of furnishing. 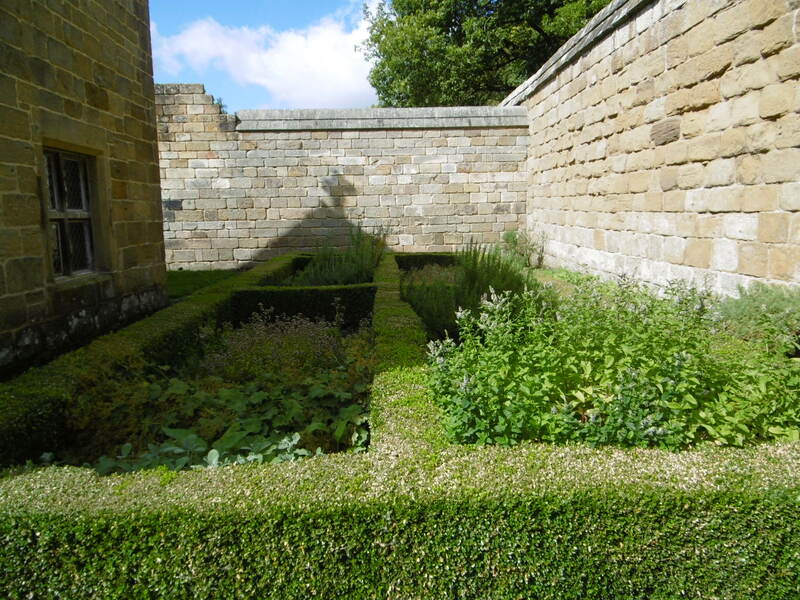 Historic sites endowed with quiet custodians – and a short guide book. I know, shameful admission. I am ashamed. But it’s true. 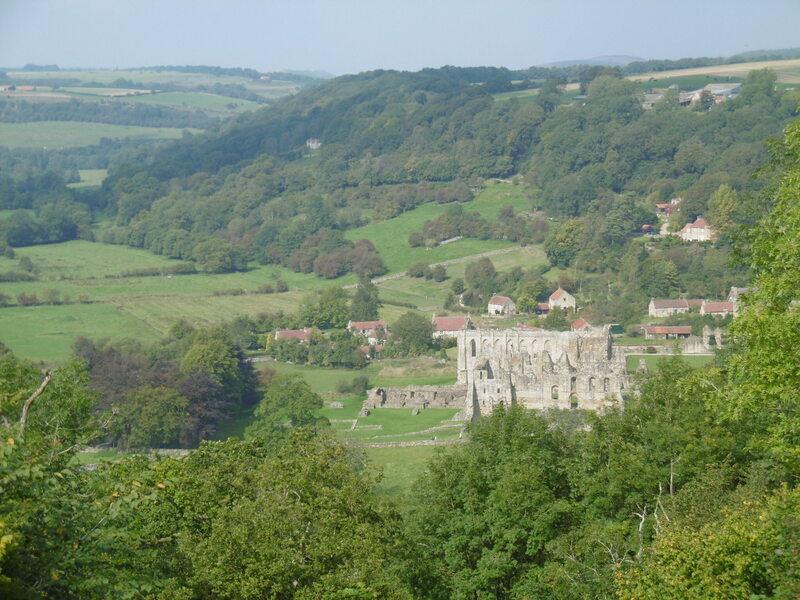 A few weeks ago we went holidaying in God’s own county – Yorkshire folk are modest about their home – which has more than its fair share of romantic ruins. The weather gods cooperated nicely. Early mornings hazy with autumnal mist. Afternoon skies of Lapis-blue, humming with insects. Fields patchworked by dry stone walls and speckled with nibbling sheep. 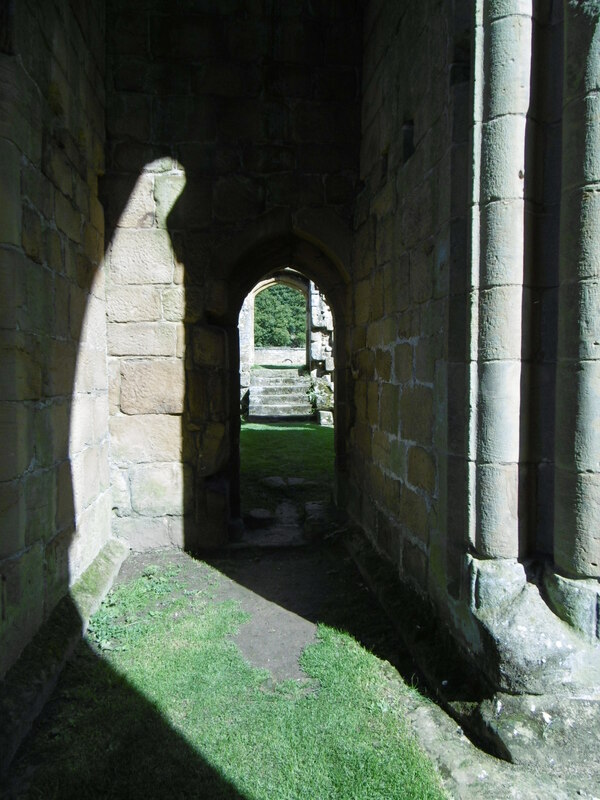 The first romantic ruin – a hasty swerve off a fast major road that almost had me praying – was Mount Grace Priory. There, before the smash and grab of King Henry the greedy, Carthusian monks lived isolated lives in a community of non-communication. It was built as a kind of commune of hermits – they came together only for prayer in the chapel – around three times a day. Seen with modern eyes, it sounds an idyllic life. A small cottage, meals delivered, a little garden for growing herbs and vegetables. But then there was the prayer. And the work. And the lack of sleep. The routine, at the original monastery at Chartreux, still begins at 11.30 at night, with prayer. Two or three hours later there’s a short sleep.At 6.30 in the morning a day of alternating prayer and work begins, ending around 8 pm with another snooze. I feel sleep-deprived just thinking about it. 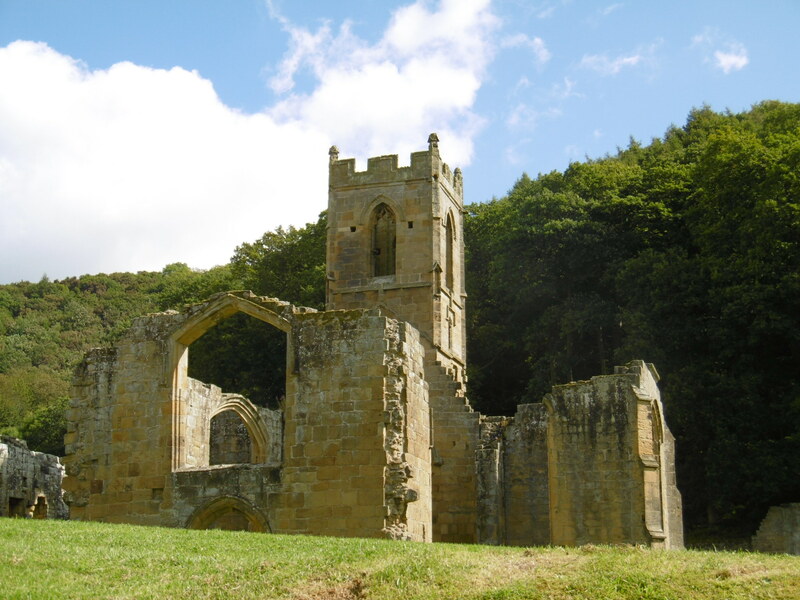 Anyway, in common with the other ruins we visited, Mount Grace suffered destruction as a result of Henry VIII’s ‘dissolution’ of the monasteries. But there’s still a remarkable amount left standing. Each ruin I visit makes me marvel at the labour involved in building such monuments to the Christian God. Massive blocks of stone – quarried, transported, shaped, stacked. Fragments of glass painted, joined, with strips of lead, into delicate-looking but formidably strong – and beautiful – windows. And all destroyed by a man who wanted to dispose of one wife and take another. To sever his ties with an inconvenient Pope in Rome. It’s not a simple part of our history and one brought up ‘Roman’ Catholic must beware oversimplifying – especially when it comes to the martyrs. Bonfires were lit under many people in those dark days, not just Catholics – and not all the monks were blameless souls praying for others. In fact, monks were some of the canniest businessmen of their day. 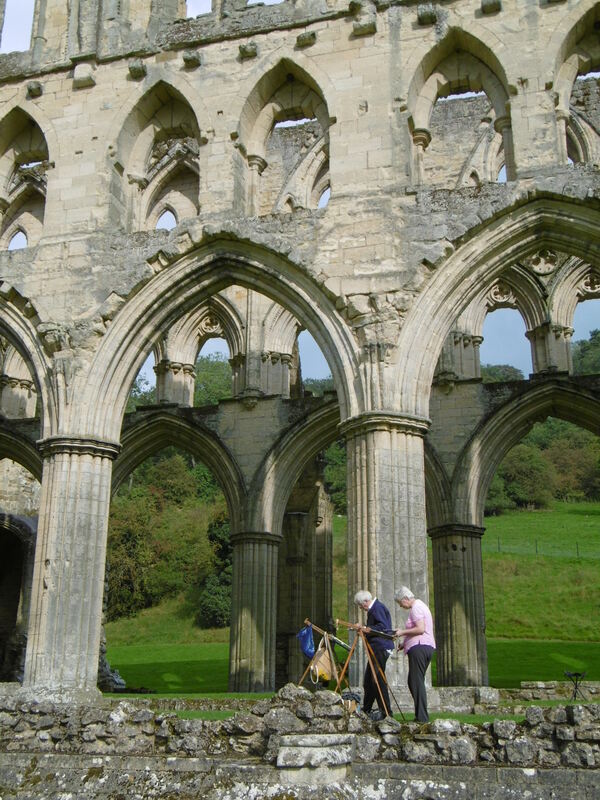 As you learn at Rievaulx Abbey. 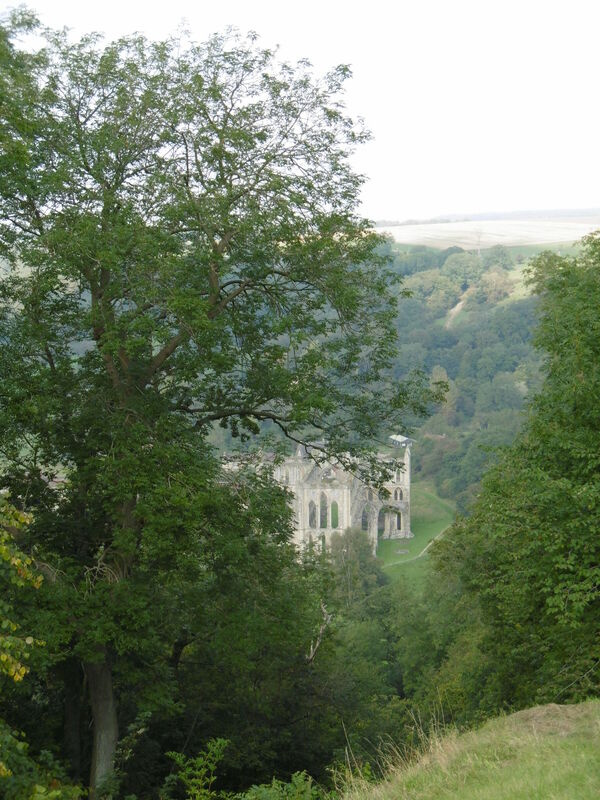 Rievaulx has a special place in my affections because of its name. I don’t know whether schools in Britain still do the ‘house’ thing. It was (maybe is) a kind of club within your school that everyone had to belong to – they had a team colour and tended to be sports-dominated. When I first went to ‘big’ school, aged 10, our houses were named after sites of martyrdoms. Gruesome. But some kind nun must have realised we had enough ‘grue’ in our diet, what with our patron being Margaret Clitherow, a butcher’s wife who was put to death by being crushed beneath a door. It was with some affection, then, that I gazed down upon the ruins from my vantage point near a ‘temple’. 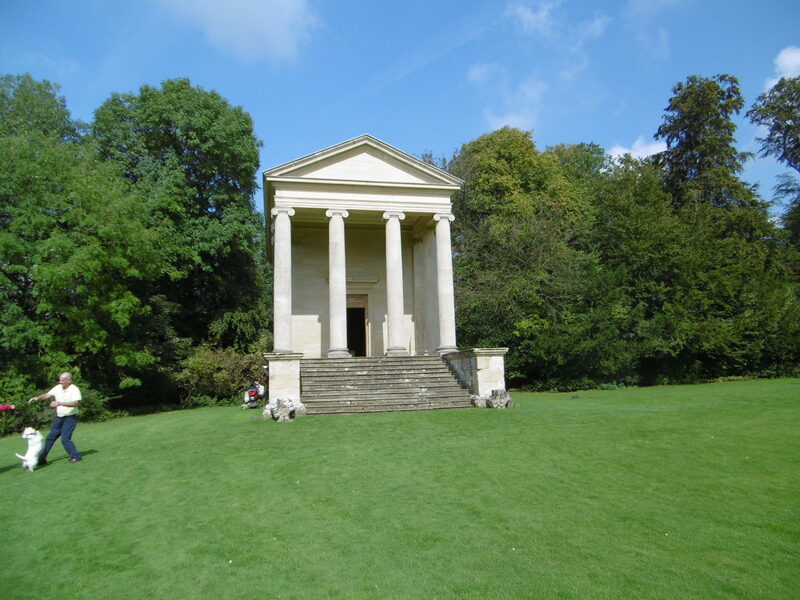 A temple built as a summer dining house by the lucky chap who bought up some of the ruined abbey’s estate. Gorgeous, spectacular, dreamy, romantic. And beyond my ability to capture with a small silver box and millions of pixels. I still hadn’t learnt how to focus on the distant vista – the hazy day and pale ruins combined with an automatic focus fixing itself on dark greenery was not a good combination. Nice dining room for occasional use! A walk of a mile took us from one temple to another, oohing and aahing at views along the way, before we descended the valley to the abbey. 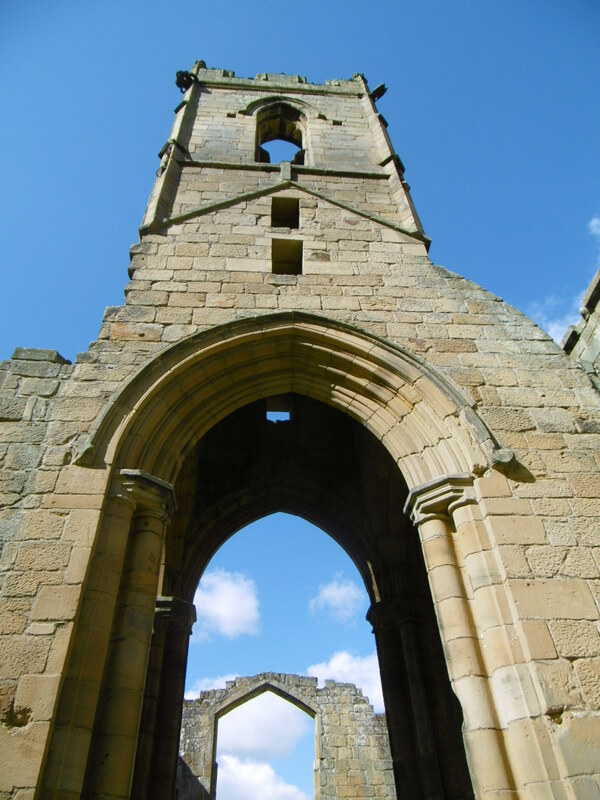 Sheep and their wool eventually made the abbey rich – and made it a key part of the regional economy – so when disease among the sheep ruined its finances, the king of the time had to step in to save it. A bit like the banks and the banking crisis. As a big enterprise, covering a wide geographical area, many lay people – and their families – depended upon the monks. When the monasteries were destroyed it was not just the religious who suffered. Today, these haunts of poets and water-colour artists stand forlorn. Romantic, but also tragic. Is romance always tinged with sadness? Is it that knowledge, lurking beneath the pleasure, that all good things must, one day, change? One day, come to an end? I peer through the evocative, empty windows, wander the lumpy grounds and wonder. If only Henry hadn’t – what would this island be like, today? We’ll never know, but we can imagine. Make stories of our own. People it with ascetic, holy men or fat self-indulgent abbots. And sheep. Historians can argue its meanings, poets ensnare its mood in words, artists capture its afternoon shadows in paint. For that, I suppose, we have Henry VIII to thank. 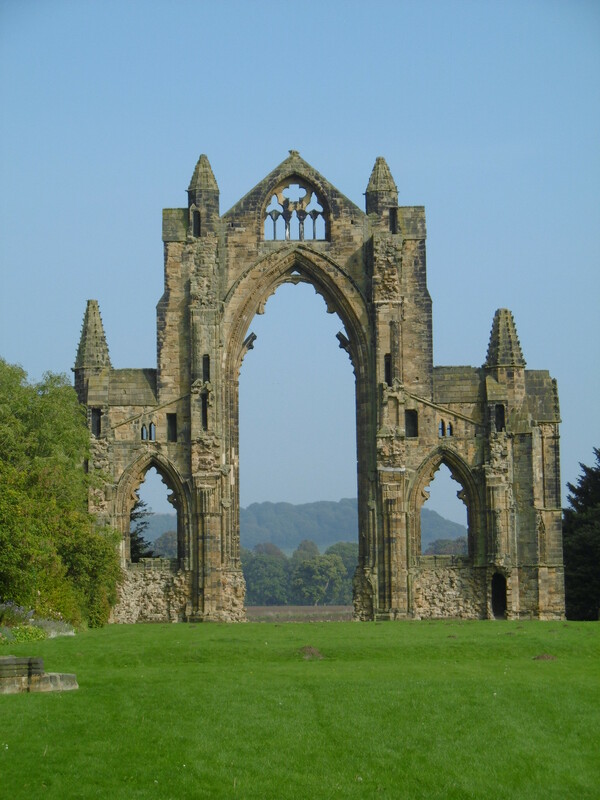 This entry was posted in Art, jaunts & going out, Yorkshire and tagged Carthusian monks, dissolution of the monasteries, England, Guisborough Priory, Henry VIII, monks, Mount Grace Priory, Rievaulx abbey, ruins, views, Yorkshire. Bookmark the permalink. My sister and I were dragged around many ruins as children by our father. As we lived on the wirral the ruins of choice were mainly castles in North Wales. As a child I found them fascinating and my imagination had them fully built and filled with soldiers. These days I visit many ruins with my young daughters but I now feel sadness at the loss of these buildings. I often wonder what would be best, to leave them to fall down entirely and be lost forever as is happening with many of them due to lack of funds or to rebuild them with skilled craftsmen so they are as new. Sadly the only way to raise funding for such a rebuild would be to turn them into theme parks and that would be so much worse than leaving them as ruins. The house system is still in use in many schools, my three daughters all belong or belonged to houses even in their primary schools. I remember I was in ‘Bennett’ house in my grammar school (Calday Grange, West Kirby) but the houses were rather boringly named after previous headmasters I believe. Yours was much more interesting! My dad wrote and illustrated two little books for (mainly) schools – Discovering Castles and Discovering Houses – a third (Abbeys) never went to print. 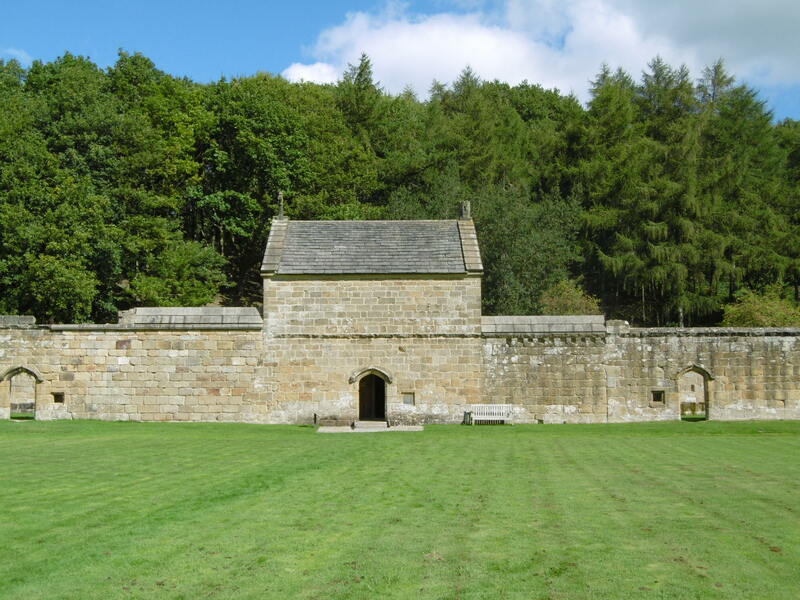 Like you, we majored on north Wales castles as at that time he was a schoolmaster in a college in Blackburn – but wherever we went it was with architecture firmly in the forefront. I really loved the castles but not the grand houses. I don’t really like rebuilds – as I think I may have said in my post (!) I like ruins – but even ruins need conservation. The National Trust seems to have some odd priorities. English heritage too – but on this summer’s evidence at least EH’s guide books are getting better – even I can tolerate them! My dad would be turning in his grave at this – after retiring as a disillusioned head of a boys’ grammar school he ended his days volunteering in a National Trust property and spent his other spare time cataloguing its artefacts. I was a big disappointment! This is a favourite. Thanks for Guisborough and Mount Grace, which I hadn’t come across.